There is so much that could be shared from the first-ever Legacy Grandparenting Summit, but one essential thing I must share is Larry Fowler’s Christian Grandparenting Declaration. Larry challenged us with this the first general session of the Summit (November 15, 2016). Pastors, is this not how you want the grandparents in your church to see their roles? Click here to watch this video. Below is the entire text (edited slightly). Yes, it is on the long side, but every bit of it matters, because intentional Christian grandparenting matters. Please share this with the grandparents you know and the other leaders in your church! I’ve received the grace of the Gospel of the Christ of the Bible and I desire to be a life-long devoted disciple. I love my grandkids, so I will hold them when they’re born, I will cuddle them when they are one, chase them when they are two, read to them when they are three, play with them when they are four and laugh at their jokes when they are five. I’ll support them, exhort them, cheer them, revere them, I’ll praise them; even help raise them. I will be there for them, but that’s not enough! As an intentional Christian grandparent, I will do more. Deal with the dilemma of distance. Pray with passion and purpose. 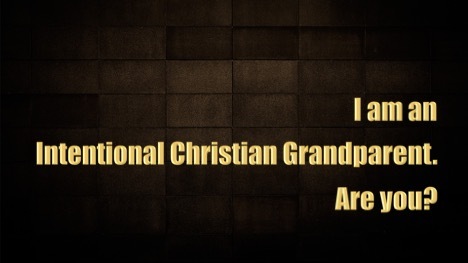 I am an Intentional Christian Grandparent and this is my declaration! Imagine what your Children’s Ministry, Youth Ministry and Family Ministry could look like if this declaration was embraced by the grandparents in your church and reflected their heart for passing on a heritage of faith to their grandchildren? Commit to equipping and engaging the grandparents in your church so they are Intentional Christian Grandparents, because grandparenting matters!